Taking the title of the highest peak in Europe, Mt. Elbrus tops out at 5,642 meters. 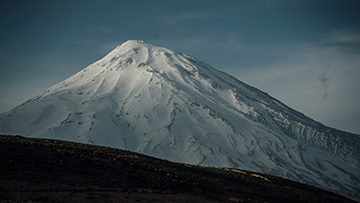 A freestanding dormant volcano located in the Caucasus Mountains of Russia, Elbrus packs an obvious punch because of the altitude, but also because of its historically nasty weather. The name Elbrus is actually derived from the local word, meaning cyclone. We were really hoping to not have to deal with the Elbrus cyclone weather as we made preparations for the Red Fox Ski Monsters Expedition Race. Geboren am 21. August 1980, lebt Klaus gemeinsam mit seiner Frau Miriam und den drei Töchtern in Weißenbach bei Haus im Ennstal. Beruflich ist er Amtsleiter der Marktgemeinde Haus im Ennstal. Klaus war Mitglied des österreichischen Nationalkaders im Skibergsteigen. Seit einigen Jahren ist er als Extrem-Läufer erfolgreich. 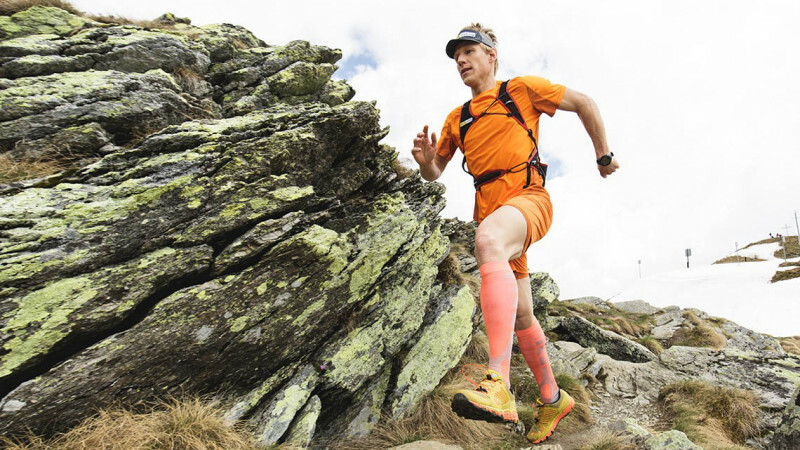 Unter anderem hat er 2015 gemeinsam mit Markus Amon den Großglockner Ultratrail gewonnen. Im Oktober 2016 und im Juni 2017 hat er für Österreich an den Ultratrail-Weltmeisterschaften teilgenommen. 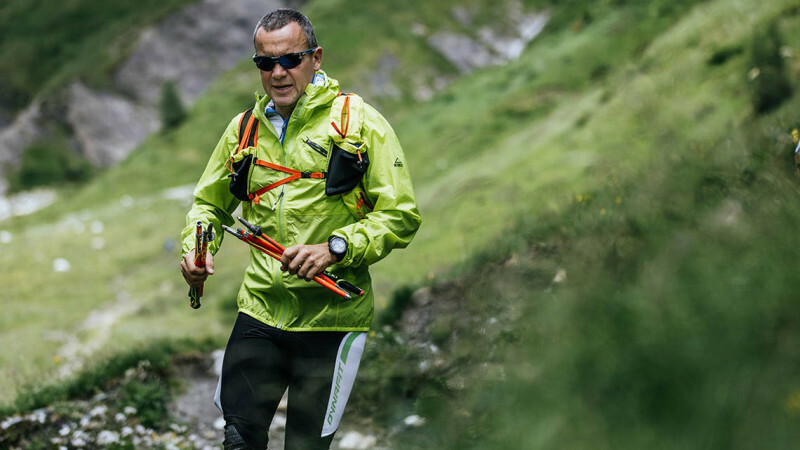 Im Juli 2017 feierte er seinen zweiten Sieg beim Großglockner Ultratrail. Sein bekanntestes Einzelprojekt ist Crossing Styria im Juni 2016. Damals ging es für ihn quer durch die Steiermark, von Graz bis auf den Gipfel des Dachsteins. Für 230 Kilometer und 10.000 Höhenmeter benötigte er 35 Stunden. Geboren am 19.09.1973, wohnt Markus mit seiner Ehefrau Magdalena und den beiden Söhnen in Maishofen. Als Chef der Flugretter des ÖAMTC (Technical Operations Manager) ist er Sommer wie Winter mit alpinen Herausforderungen konfrontiert. Das reizt ihn auch in seiner Freizeit. Schon seit frühester Kindheit hat es ihm der Bergsport angetan. Später kam er über das Training für Expeditionen (Höhenbergsteigen) zum Trailrunning. Die Ultrabewerbe sind für ihn in Sachen Mentaltraining die ideale Vorbereitung für das Bergsteigen im Expeditionstil. Dinge werden im Kopf entschieden. Markus Amon hat bereits eine Reihe von Sechs-, Sieben- und Achttausendern by fair means bestiegen. Sein größtes Ziel, der Mount Everest, steht allerdings noch aus. Im Laufsport war der gemeinsame Sieg mit Klaus beim Großglockner Ultra Trail im Jahr 2015 einer seiner wichtigsten Erfolge. Sportliche Höchstleistungen mit fairen Mitteln – das ist oberstes Ziel beim Projekt Crossing Austria. Unterstützt werden Klaus und Markus durch die Sportmedizinerin Dr. Silke Kranz. Sie übernimmt die individuell auf die beiden abgestimmte, innovative sport- und ernährungsmedizinische Betreuung. Erfahrung mit Extremprojekten hat Dr. Silke Kranz bereits: Sie begleitete Klaus Gösweiner beim Projekt Crossing Styria sowohl in der Vorbereitung als auch direkt beim Lauf. Our group of three traveling to Elbrus consisted of two Austrian skimo stars, Veronika Mayerhofer and Johanna Erhart and myself. Veronika and Johanna had amazingly finished 2nd in the Sellaronda Ski Marathon and were 3rd in Patrouille des Glaciers, just a week before Elbrus Ski Monsters. However, the Elbrus race is higher, farther, and has more climbing meters than any of those races (and any other single day race we know of), and was the final test of the season for the Dynafit duo. 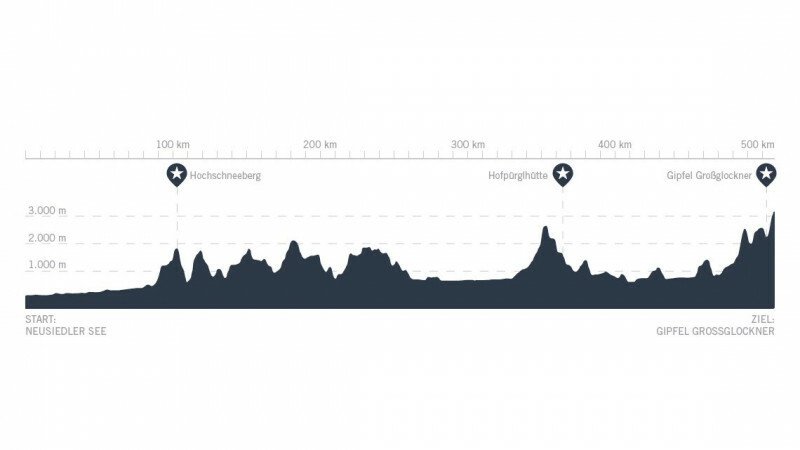 With nearly 50 km of distance, 5,000 meters of ascending, and the summit of Elbrus right in the middle of the race, it's a massive day that demands perfect preparation, flawless weather, as well as great legs and lungs. We flew from Munich to Moscow, and onto Mineralye Vody where we hitched an adrenaline packed taxi ride three hours to the mountain town of Azau. The small town of Azau is the base camp for all mountaineers and skiers giving Elbrus a go and our initial impressions of the area were overwhelmingly positive. The people of Azau, the organizers from Red Fox, as well as the fellow skiers and mountaineers welcomed us immediately. We did not expect such friendly and outgoing people, amazing local food, and best of all, sunny days. Feeling good after traveling, Veronika, Johanna, and I were soon skinning up the lower flanks of Elbrus from Azau to start the acclimatization process. At 4,000 meters, our hearts and heads started pounding and the conversation stopped, we knew that we had gone high enough for day one. There's no faking the acclimatization process. But Veronika and Johanna had never been above 4,400 meters and it was important to see how their bodies would react to the high altitude before the race. So with three days to go before the race, we geared up and made a push to get to the summit. Slow and steady, they made their way to the top of Elbrus on a stunning summit day. The acclimatization process was finished and the team was ready to spend two days eating and experiencing the Russian mountain culture, but mostly to rest hard in preparation for the race. On May 2nd, clear skies and a beautiful sunrise showered Azau with light just minutes before the start. 17 teams (two skiers per team) started up the initial climb of 1,500 meters, clearly there is no time for messing around on Elbrus. Veronika and Johanna set off with a conservative pace and came into checkpoint 1 (CP 1) in fourth place overall. Looking and feeling good, they started the descent to CP 2 at the waterfall, where they transitioned and started the unrelenting climb to the summit. One of the most daunting characteristics of Elbrus is that from wherever you are on the treeless volcano, you can see the summit looming thousands of meters above. With the goal in sight, Veronika and Johanna continued pushing up the mountain. Spandex race suits, lightweight gear, race bibs; the racers didn't exactly fit in with the other mountaineers that were in full down suits. 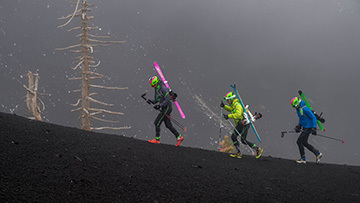 But once again, the mountain was delivering perfect conditions and the racers were able to stay warm with race suits and lightweight layers on top as they continued moving. Up to 5,000 meters, Veronika and Johanna sustained a strong pace, trying to only stop once or twice an hour to eat. But at the saddle, Johanna was really having to dig deep to keep moving, and took a break at the checkpoint to eat, drink, and talk with the volunteer doctor. At this point, Veronika was carrying Johanna's skis to help lighten the load, and with a strict time cut-off to make it to the summit and back to saddle in less than two hours, there was a sense that this could be the end of the race for them. But within five minutes the doctor cleared her to go and she was back on her feet, charging up the mountain again. Both girls continued to show strength and positivity throughout the climb, determined to summit Elbrus and return safely to the saddle. The final steps to the summit were a beautiful combination of exhaustion and exaltation; every single step to the top of Europe was finally paying off. With as much excitement as possible at that altitude and in the middle of a skimo race, the team transitioned once again from crampons back to skis for the descent. 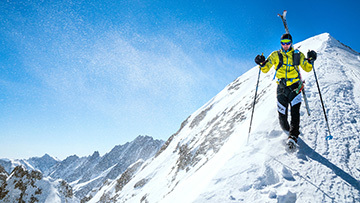 Skiing from 5,642 and around -15 C all the way down to 3,000 meters and +15 C is a truly unforgettable descent! With a final 500-meter climb to the finish and closing in on ten hours of racing, Veronika and Johanna heroically finished with smiles on their faces. Happily exhausted, they crossed the finish line and embraced for a minute, whispering congratulations and thank yous to each other. Watching the girls let their emotions out after such a high intensity day, spectators and volunteers were also tearing up. The sun was out and the girls had finished the Red Fox Elbrus Ski Monsters race safe, and with a big victory in the women's division and only bested by a few men's teams. A big thank you goes out to Red Fox for organizing the Elbrus Race Festival as well as the countless volunteers on the mountain. 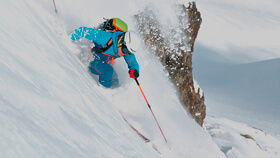 There are a lot of skimo races nowadays, but to race to the top of Europe is exceptionally challenging and rewarding, the ultimate skimo adventure and something that any serious skimo racer should put at the top of their bucket list.